This house is known as the Paperclip House, as can be seen by the giant red paperclip statue on the front yard, and is located in Kipling, Saskatchewan in Canada. This house may seem like just some ordinary middle-income house, but it has a truly extraordinary story. 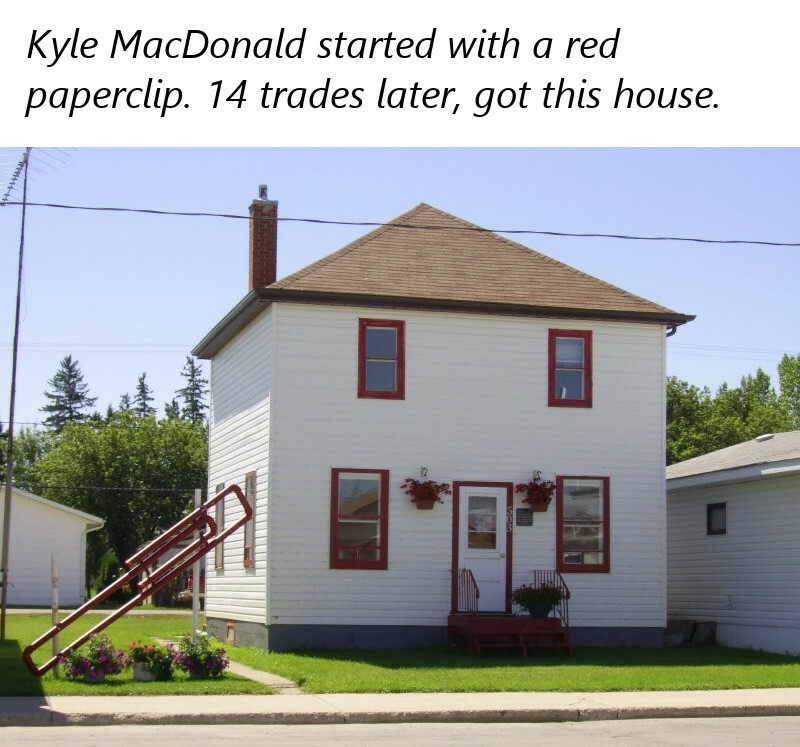 In fact the owner, Kyle MacDonald traded for this house, started only with a red paperclip! This may sound crazy, and it is, but this actually did happen. Basically he wanted a house of his own but had no job and instead of looking for a job, he decided he would trade his way up to a house. So he posted his red paperclip online and quickly traded it for a pen that looks like a fish. After 14 trades in total, he finally was able to trade for a house! The full list of his trades are listed below. Trade 1: He traded his red paperclip for a pen that looks like a fish. Trade 2: He traded the pen for a handmade doorknob. Trade 3: He traded the doorknob for a camp stove. Trade 4: He traded the camp stove for a 100-watt generator. Trade 5: He traded the 100-watt generator for the "instant party kit", which was an empty keg and illuminated Budweiser beer sign. Trade 5: He traded the kit for a Bombardier snowmobile from a Montreal radio host. NOTE: I am still looking for what the trades were for Trades 6 to 12, so I will update this list periodically as I find the answers. If you happen to know them please comment below! Trade Number Unknown: He traded an afternoon with rock star Alice Cooper. Trade Number Unknown: He traded for a KISS snow globe. Trade 13: He traded the snow globe for a paid role in a Corbin Bernsen movie called Donna on Demand. Trade 14: He traded the movie role for the house seen in this article! Fun Fact: The statue of the giant red paperclip USED to be a Guiness World Record too for the largest paperclip but I believe it has since been beaten!